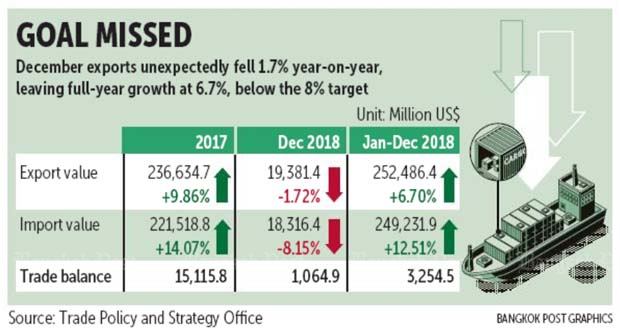 Exports fell for a second straight month in December, dropping the full-year performance for 2018 to 6.7% growth and missing the 8% target set by the government. The Commerce Ministry reported Monday that customs-cleared exports unexpectedly shrank by 1.7% year-on-year last month with a value of UScopy9.4 billion after contracting 0.95% in November. The December decline was the third in 2018 after exports in September shrank 5.2% year-on-year. 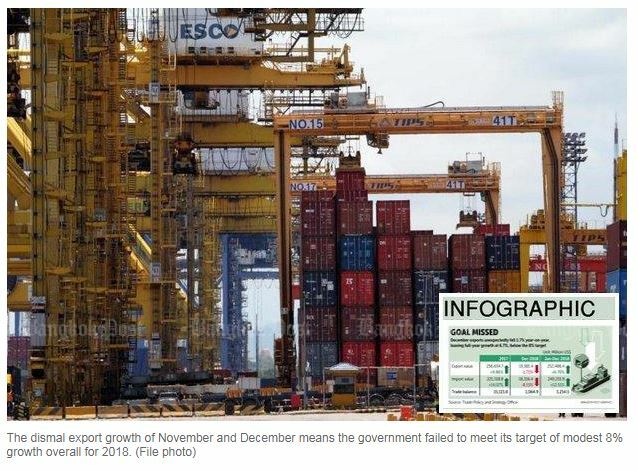 “This [drop] coincides with the recent global trade slowdown, ongoing trade disputes and disruptive emerging technological innovations in electronic products,” said Pimchanok Vonkorpon, director-general of the Trade Policy and Strategy Office under the Commerce Ministry. According to Ms Pimchanok, exports to most markets weakened and were influenced by electronic products such as computer and electronic circuits, especially in markets tied to Chinese supply chains such as Hong Kong, South Korea and Taiwan. Exports to China in many products contracted in response to a slowdown of Chinese import and export figures recently released, she said. Exports to the US, Japan and Asean grew at slower rates of 0.6%, 2.7% and 2% respectively. Industrial product shipments fell by 0.8%, dragged by computers and parts (-16.9%); semiconductors and diodes (-40.4%); facsimiles, telephones and parts (-19.0%); and wood and wood products (-25.8%). But some exports expanded at a favourable rate: for example, oil-related products (+8.0%); internal combustion engines and parts (+23.0%); gold (+20.9%); rubber products (+4.3%); and iron, steel and related products (+3.6%). For all of 2018, exports of industrial products rose 6.6%. Shipments of agricultural and agro-industrial products fell by 6.6%, including rubber (-32.3%); cassava products (-22.8%); rice (-5.5%); frozen and processed seafood (-4.1%); and frozen and processed shrimp (-13.2%). Some product shipments bucked the trend: for example, sugar (+39.0%); frozen and processed fruits and vegetables (+9.5%); and frozen and processed chicken (+4.5%). For all of 2018, exports of agricultural and agro-industrial products grew by 2.6%. Total export value in 2018 rose 6.7% year-on-year to $252.5 billion. On the import side, the value in December 2018 decreased 8.2% to copy8.3 billion, resulting in a trade surplus of copy.06 billion. For 2018, import value rose 12.5% to $249.2 billion, bringing a trade surplus of $3.25 billion. According to Ms Pimchanok, the recent trade truce and Chinese commitments to reduce the country’s trade surplus with the US by increasing its US imports over a six- year span are good omens that signal improved global economic sentiment. The Commerce Ministry will closely monitor the situation and prepare both defensive and active measures for appropriate actions in the future. According to Ms Pimchanok, to achieve this year’s export target of 8%, the Commerce Ministry has placed its emphasis on preparing export and investment promotion schemes, utilising key strengths of product diversity and competitiveness in order to expedite exports to new potential markets and to facilitate greater access in current ones with area-customised strategies through both offline and online platforms. Additionally, Thailand aims to enhance strategic partnerships with potential trading partners such as South Korea and, as Asean chair in 2019, to strengthen trade cooperation in the regional bloc to diversify export risks and collectively prepare possible solutions in response to unsettled trade disputes, she said. Ghanyapad Tantipipatpong, chairwoman of the Thai National Shippers’ Council (TNSC), said the December drop in exports was unexpected. According to Ms Ghanyapad, the TNSC is maintaining its export growth forecast of 5% for this year, but she confirmed that all parties need to work harder to boost exports and focus on the promotion of individual product items and export destinations. Visit Limlurcha, vice-chairman of the TNSC, said that based on the export performance in the last three months of 2018, it’s clear that Thailand’s overall exports are being affected by the escalating trade war, especially for products Thailand ships to China to be assembled and re-exported to the US, such as electric circuits, electronics and components. Thailand’s foreign exchange was also not beneficial to exports, Mr Visit said.